World War II 1944, soldiers and civilians are dying throughout Europe and beyond, the war is drawing to a close, Hitler is becoming desperate. Arguably tracking and attempting to repatriate art, stolen by the Nazi’s, was not high on most soldiers agenda. However, with the consent of President Truman and under command of Frank Stokes (George Clooney) a small team is dispatched to Europe. So begins an attempt to preserve the culmination of centuries of human creativity, before it is destroyed or lost forever. We are introduced to an eclectic assortment of men, Englishman Donald Jeffries (Hugh Bonneville) only recently returned from the bottom of a bottle. Richard Campbell (Bill Murray) an architect, James Granger (Matt Damon) from the Met, with Walter Garfield (John Goodman), Preston Savitz (Bob Balaban) and Jean Clermont (Jean Dujardin) rounding out the male cast. The team is assisted by a distrustful French Art curator Claire Simone (Cate Blanchett), armed with the knowledge to help but unsure of anyone’s real intentions. With Clooney as director, a great cast and a decent budget to spend, we should be in for a treat, as the team complete derring-do missions to save heritage for future generations. The film opens well, as the team are assembled, the comradeship between the group is helped by the palpable real-life friendship that exists between the main acting cast, a promising beginning. Unfortunately, as the story requires, the team are immediately sent their separate ways with seemingly vague tasks to complete, limiting any opportunity for much on-screen chemistry. Suspense or tension is almost non existent and whilst based on a rollicking true story, the screenplay manages to squander the rich source material. The film comes across as “Oceans 11 the war years” the treatment of such a serious subject matter is too irreverent and when pathos is introduced, the tone is badly mismanaged. The film is not helped by a ridiculously jaunty soundtrack which misjudges the on-screen action. Even when tragedy strikes the team, it is difficult to care. Clooney is the most likeable of actors but as director of the film, must take responsibility for what can only be described as an amateurish movie, that manages to fall between every recognisable genre, drama, tragedy and comedy. Blanchett does her best in difficult circumstances but appears to be the only actor taking the film seriously. A potential romantic sub plot is a mistake and again drains away any tension into jokes about neck-wear. There is one touching scene where a record from home is played over the camp PA but this is far too late to rescue the story. Overall a collection of scenes that show the protagonists doing nothing of substance, there are no harsh wartime realities, anything approaching real life is quickly airbrushed over with a glib remark or expression. Either the film should have taken a more comedic approach, a route clearly marked “perilous” or opted for a harder edge, with an age certificate to match. It is clear that maintaining a suitable tone was of concern, as the film was initially pushed back. The film we get to see, manages to provide an uncomfortable compromise arguably pleasing no-one. 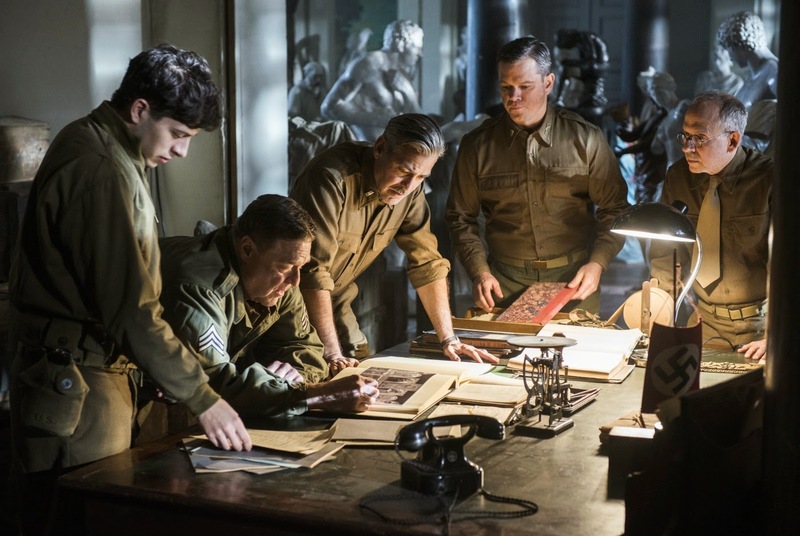 The film is loosely based on the book by Robert Edsel “The Monuments Men: Allied Heroes, Nazi Thieves and the Greatest Treasure Hunt in History”. A disappointing movie, despite early promise. A “dramedy” war film that is unsure what it wants to say and in the end, says nothing at all. Moderate box office returns, despite high expectations, suggests early word of mouth deterred audiences, despite a star studded cast and promise of a rollicking good adventure. There is a great story waiting to be told, unfortunately this is not that film.